They're particularly worried about a disposal site proposed two hours northwest of Ottawa. Gilles Provost, left, listens as President of the Canadian Coalition for Nuclear Responsibility Gordon Edwards speaks during a news conference in Ottawa on Aug. 21, 2018. OTTAWA — Environmental groups say Canada should stop producing nuclear energy until the federal government replaces its "pathetic" waste disposal policy with something more meaningful and scientific. The groups, including the Canadian Coalition for Nuclear Responsibility and the Canadian Environmental Law Association, intend to protest outside a meeting Wednesday where officials will discuss plans to decommission nuclear labs and reactors in Chalk River, Ont., and Pinawa, Man. The groups are particularly concerned about the proposal to build a surface-level disposal site at Chalk River, about two hours northwest of Ottawa, that would house a million cubic metres of waste just a kilometre from the Ottawa River, and to bury underground nuclear reactors at the sites in concrete. Experts were extremely critical of Canada's nuclear waste policy at a news conference in Ottawa on August 21, 2018. Neither proposal meets international guidelines for the handling of nuclear waste, they say. Indeed, Canada's only written national policy on radioactive waste is so short it would take less than four tweets to post it on Twitter, said coalition president Gordon Edwards. "Canada's nuclear waste policy is pathetic," he said. The policy calls for radioactive waste disposal to be done safely and in an environmentally sound, comprehensive and cost-effective manner. It also says Ottawa must ensure radioactive waste producers meet their responsibilities and pay for any required disposal. 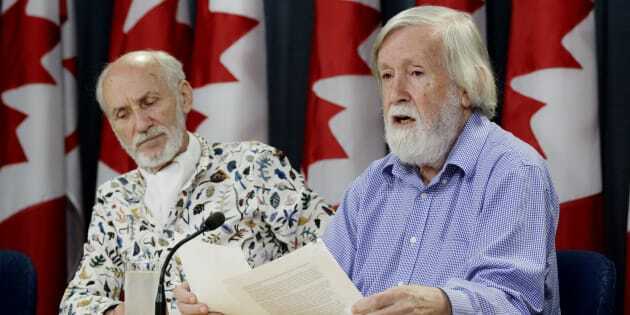 The policy is entirely silent on science or agreed upon best-practices for how waste should be disposed, say opponents, who want Canada to immediately halt nuclear activities until such a policy is in place, developed in consultation with the public and interested parties. Thus far, burying properly encased radioactive waste in tunnels in the ground is the best option, but no one is certain of the long-term consequences, critics say. Encasing facilities in concrete so that they can never be safely accessed later is short-sighted, they warn. Atomic Energy Canada Ltd., a federal Crown corporation, contracted Canadian Nuclear Laboratories, a privately-owned consortium, to decommission nuclear sites. The decommissioning proposals are currently undergoing an environmental assessment process with the Canadian Nuclear Safety Commission, a spokesman for Canadian Nuclear Laboratories told The Canadian Press. Nothing has been approved and that assessment is done with public consultation, the spokesman said. Wednesday's meeting is just an status update and will not decide anything, he added. Nevertheless, Edwards said, Ottawa needs to acknowledge that Canada put the nuclear cart before the disposal horse and needs to figure out the way forward before proceeding. "The first step should be to stop producing this waste," he said. "Since we don't have a solution for it of a permanent nature, we shouldn't be making it." The federal policy assigns clear roles and responsibilities to the federal government and nuclear waste owners, Natural Resources Canada said in a statement Tuesday. The proposals will not be approved unless they are safe for workers, the public and the environment, it added.